Game review: Atari Food Fight for #Atari 7800 | Fun & creative dash to the ice cream cone! Who doesn't love a food fight? If John Belushi taught us anything (via Animal House) it's that food fights are fun. 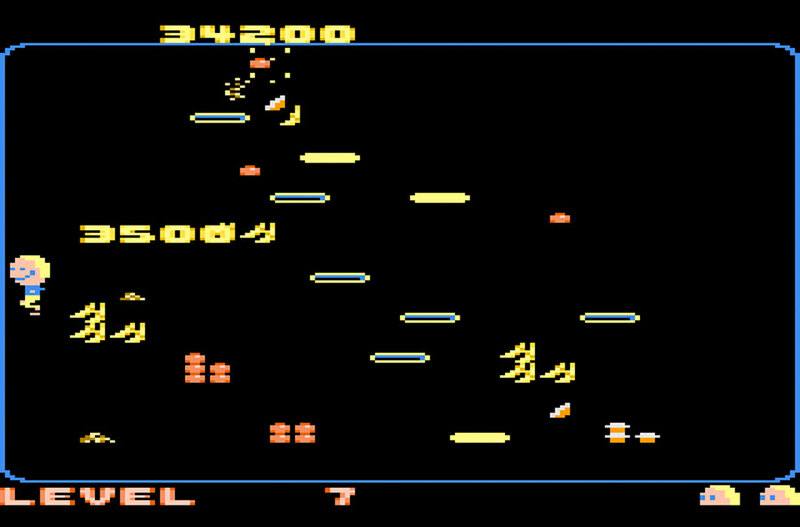 Atari has done a great job porting this arcade game to the 7800 with many options and levels of increasing difficulty. I'd never seen this gem in the arcades and was surprised to later find out it was actually an arcade game. Also appearing on the Atari 800 (my cart may be a hack), this game involves navigating a kid from one side of the screen to the other in an attempt to eat a melting ice cream cone while avoiding a myriad of obstacles. You play as Charley Chuck who has an insatiable appetite especially when he went to the carnival. Each time he went to the carnival he headed straight for the Food Fight contest. 1 or 2 players can play as Charley Chuck who has his heart set on eating. The arcade controls for Food Fight are simple and lend nicely to the 7800 joystick. There are four chefs (Angelo, Zorba, Oscar and Jacques) who will go to great lengths to prevent Charlie from scoring his melting ice cream cone. These chefs will try to tag you in the early levels and later throw food at you in higher levels - both leaving you with one less life. Once they tag you, Charlie becomes covered in an avalanche of food. Your defense is moving fast, dodging chefs and picking up food from various piles to throw at the chefs. In some cases, Charley can force a chef back into a manhole. Very few games let you hurl food at will and each level changes the items you get to throw. In a world of ever increasing violence, its fun to throw bananas, watermelon and burgers (among others) as a satisfying means of defense. Then every few levels your game play is played back in instant replay which is sort of an odd feature, but an interesting situation that gives you a break from the harrowing action. 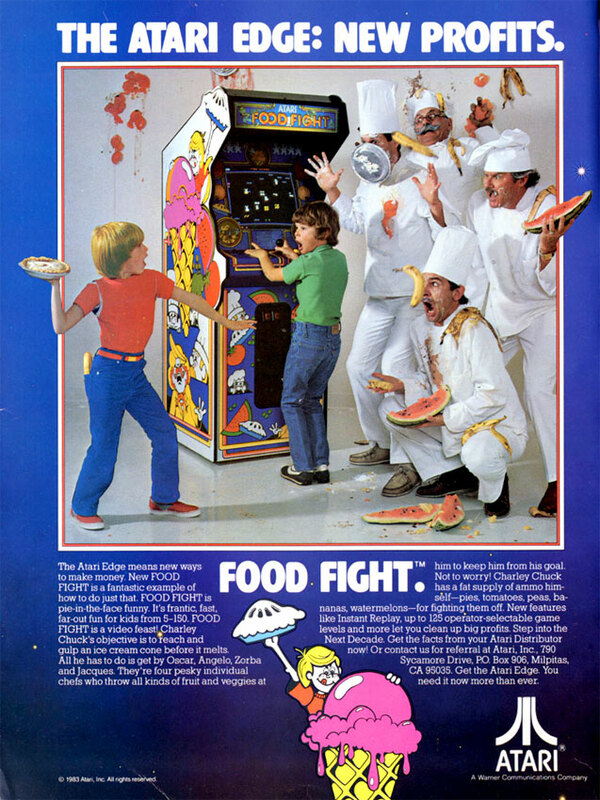 Food Fight was developed by General Computer Corporation (GCC), the same company that produced Midway's Ms. Pac-Man. 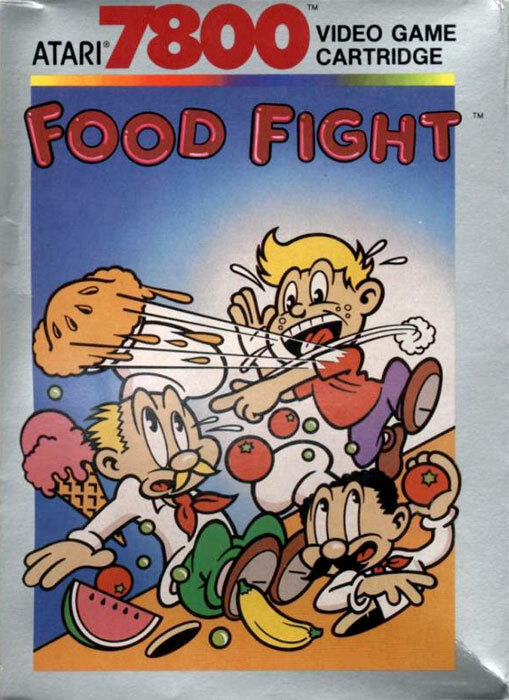 Food Fight was ported to the Atari 7800 gaming console in 1986 and to the Atari XEGS in 1988. A port for the Atari 2600 console was initially planned, but later canceled. Each ice cream cone takes 32 seconds to melt. On the first level Charley encounters 2 chefs and this increases until all 4 chefs are out to get him. Each level then has up to 10 manholes and eight piles of food to be thrown. the position of the chefs and manholes varies and at level 6 the cone will appear in different places too. Keep an eye on the chefs - when they turn yellow or blue they can't hurt Charley. That's a good opportunity to force them down a manhole. Points are awarded for all the leftovers so don't be too quick to randomly toss food around. If Charley is holding food when he gulps down the cone, he carries it with him to the next level. This is helpful on the upper levels where food is scarce and the chefs are moving fast. Each chef Charley takes out is worth a 100 point increase per chef. On a 10-chef level, the final chef is worth 1,000 points! the same math holds true for eating the cones. The first is worth 500 points until yo get 25,000 points for the cone on level 50. For 1 or 2 players, you have the ability to begin at higher levels as you become more adept at food fighting (so you don't have to suffer the easier levels). Initially, you can begin between levels 1 and 16. After playing you are able to then begin at the highest completed level. Depending on the game variation you have between 3 and 8 lives and will battle between 2 and 4 chefs. You'll get an extra life at 25,000 points and every 100,000 points afterward. When starting at level 10 or above you'll get an extra life every 10 levels. One nice feature is the ability for each player to independently select a starting level. This way a novice player can begin at an earlier level that a professional Food Fighter. Add beer and a second player and you've got an entertaining time ahead. is unique to the 7800 and although it starts slowly, you can begin at higher levels that provide a good challenge and a lot of fun. Everyone loves a food fight!